If the stylish and exceptionally functional iPhone 6 smartphone was impressive, then the Apple iPhone 6S will blow your mind. The improved A9 chip that is integrated into this device ensures all its onboard features and applications operate without a glitch. The smartphone can snap up stunning photos and videos with its advanced 12MP rear iSight camera, and the 5MP front facing FaceTime camera. The mobile’s 4G LTE support and 802.11a/b/g/n/ac specification WiFi with MIMO enable it to access blazing fast Internet from virtually anywhere. The mobile comes fitted with an enhanced Touch ID fingerprint scanner that provides you with a secure, simple way to certify Apple Pay transactions and unlock this device. A 32GB built in storage efficiently saves a substantial amount of data. The svelte space gray color of the mobile perfectly complements its rounded edges and exquisite finish. 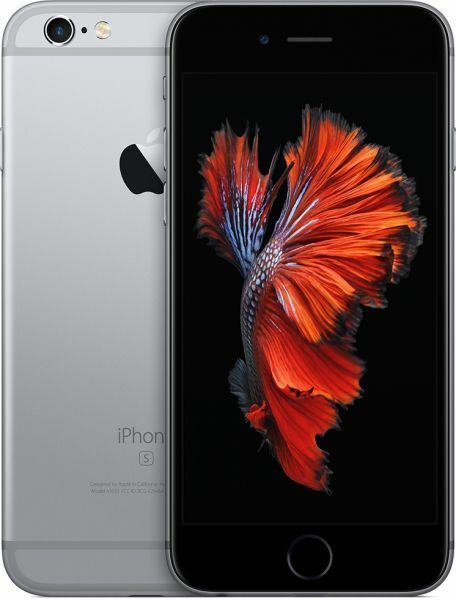 The Apple iPhone 6S’s 4.7inch Retina HD display comes with enhanced 3D Touch technology. The technology enables the phone to do all kinds of essential things faster, and with utmost ease. It can even give you haptic feedback from its advanced Taptic Engine. The Apple iPhone 6S is powered by the cutting edge 64bit A9 chip that delivers a blistering performance when you are running applications or are multitasking. This advanced chipset boasts performance improvements of up to 70 percent along with a 90 percent improvement in graphics output. The Apple iPhone 6S incorporates an overhauled 12MP iSight camera that captures sharp, detailed photos and brilliant 4K videos. The phone also takes spectacular selfies with its 5MP FaceTime HD front camera. Live Photos feature captures the moments just before and after your click a picture and sets it in motion with a mere press of a finger. The Apple iPhone 6S comes preinstalled with iOS 9 that features incredible built in apps, revamped Siri, and much more. The OS’s App Store features amazing apps that have been designed to take advantage of iPhone’s incredible processing power. The Apple iPhone 6S incorporates a 4.7inch Retina display that renders spectacular 1334 x 750 pixel resolution images at 326ppi. You can operate this phone with just one hand with room for your thumb to navigate through the device’s menu. 97.7% of users recommend this product to a friend. If you bought once an Apple smartphone you will never buy another brand. Good Quality, very well processed ! Original iPhone, delivered in 2 days. Very happy.